JustTRASHit! is a division of Trash Valet, Inc. and has been servicing Atlanta since 1997. With our "all about the customer" attitude, we always provide reliable, fair & on-time service across Atlanta and surrounding communities. 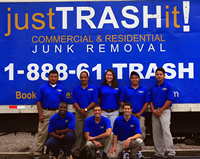 We would like to thank our customers for making us Atlanta's premier junk removal company! Got Junk? Let us haul away your old furniture, sofa, mattress, box springs, bed, dresser, desk, table, chairs, entertainment center, cabinets, appliances, refrigerator, washer, dryer, stove, dishwasher, water heater, ac unit, carpet, construction debris, lumber, wood, drywall, renovation debris, remodeling, yard debris, branches, electronics, stereo, computer, monitor, tv, scrap metal, filing cabinet, copiers, household garbage, hot tub, trampoline, office equipment, cubicles, tires and more. We haul away from basements, garages, attics, offices, foreclosures, evictions, storage spaces, restaurants and warehouses.